(You can see from this photo how my family rolls. Non-traditional, but we know how to eat.) The suggestion of matzo brei is so obvious it barely merits a mention, however I am mentioning it only to tell you that you should stop making it the way your great-grandma taught you, and switch to my gentile Uncle Bob’s superior method. When my mom’s side, the five Marks siblings and their myriad children, would get together for a Passover seder, Uncle Bob could always be found manning the stove the next morning, passing out plates of this heavenly manna. He uses the standard 2 matzos/1egg per person ratio but with these genius details: Barely moisten the matzo in water before draining thoroughly, fry the matzo in plenty of butter, and then add more butter before finally mixing in the beaten eggs. Salt generously and do not overcook. The result is a rich, buttery breakfast with a texture that is both crispy and soft. It’s so good you don’t even need syrup, just a sprinkle of salt and pepper. These lemon raspberry quinoa pancakes are super yummy. I also sometimes make a really simple pancake out of leftover cooked quinoa. Add 2 eggs per half-cup of cooked quinoa, form into patties, and fry in a couple tablespoons of vegetable oil. Jews are the unwitting beneficiary of the gluten-free/paleo fad sweeping the nation. It’s never been easier to find things to eat that don’t have wheat, and one of the most popular of these is another two-ingredient pancake: the banana and egg combo. 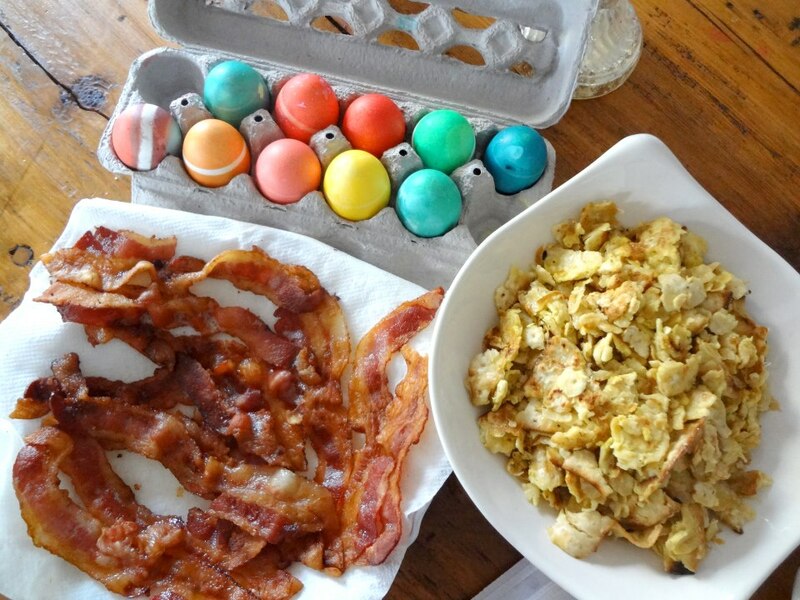 Combine one beaten egg with one mashed banana, embellish if you wish with stuff like cinnamon, vanilla, or nut butter. Fry in melted butter or coconut oil as you would a normal pancake. 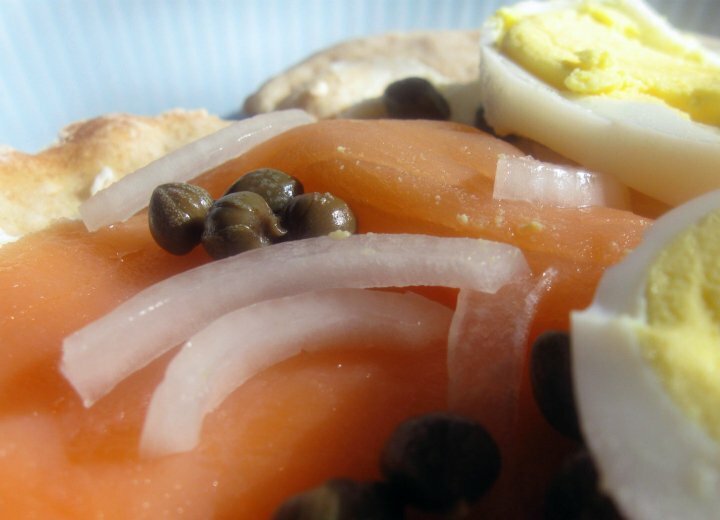 Create a spread of lox, cream cheese, capers, sliced tomatoes, cucumbers, boiled eggs, and onions. Everything but the bagels. Assemble on matzo and enjoy. If your digestion is getting a bit sluggish from all that matzo and bananas, try some yogurt and fruit for a change. A breakfast smoothie, or heck, even a smoothie popsicle is a great morning option. 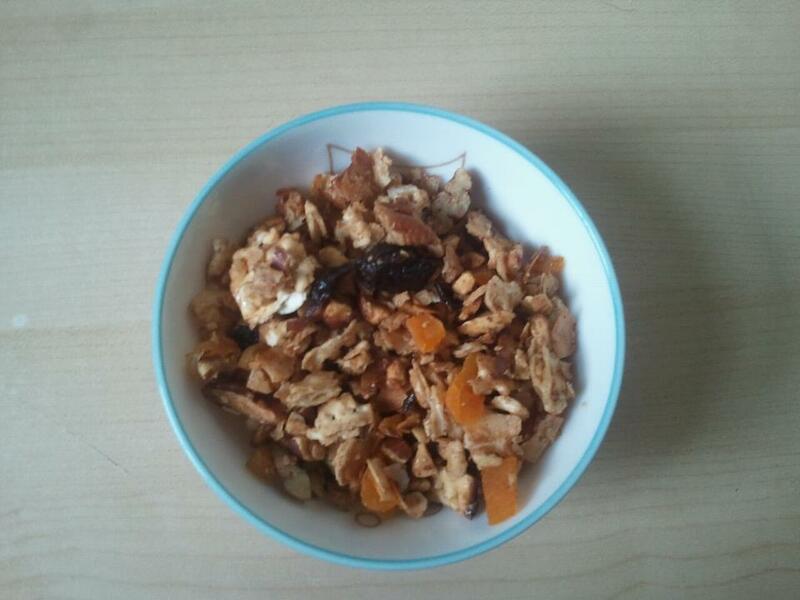 Living in Vermont, I would be remiss if I didn’t suggest a maple-y granola breakfast. 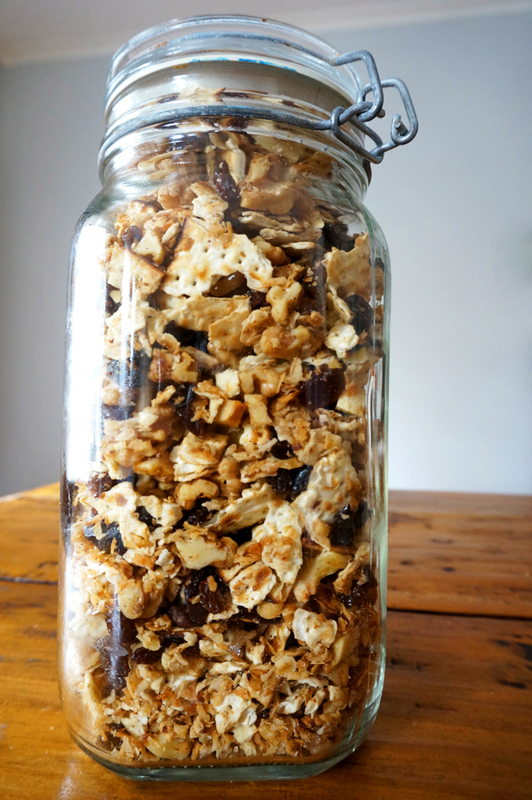 I first tried making matzo granola three years ago and WHERE HAVE YOU BEEN ALL MY LIFE, MATZOLA. 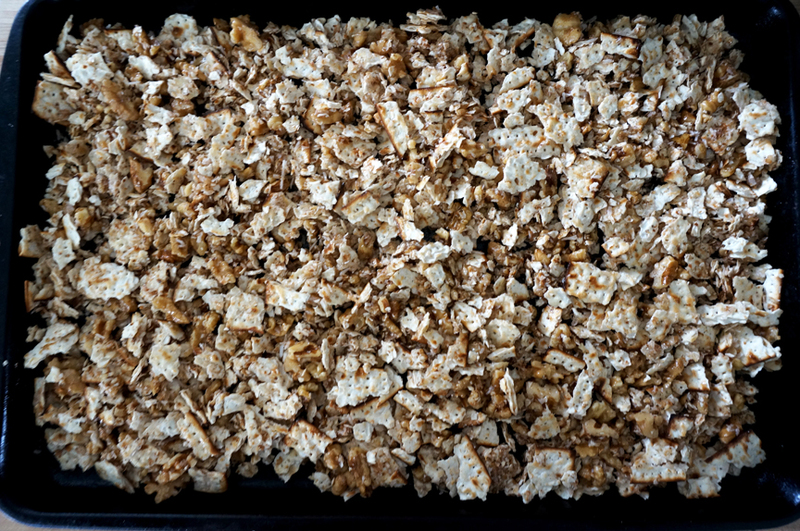 This stuff is super tasty and if you’re a morning milk-n-cereal type of person, this will fill every need you have for a bowl of creamy, crunchy, wholesome sweetness. First, you’re gonna need to crumble up six sheets of matzo into a bowl. I adapted this from a Tina Wasserman recipe that calls for matzo farfel, but honestly I try to avoid buying seventy jillion different matzo products that will all remain 3/4 full and sit in my pantry going stale for the next year. Some matzo meal and plenty of plain old matzo usually gets me through the week. So get crumbling. Add a bunch of chopped nuts. 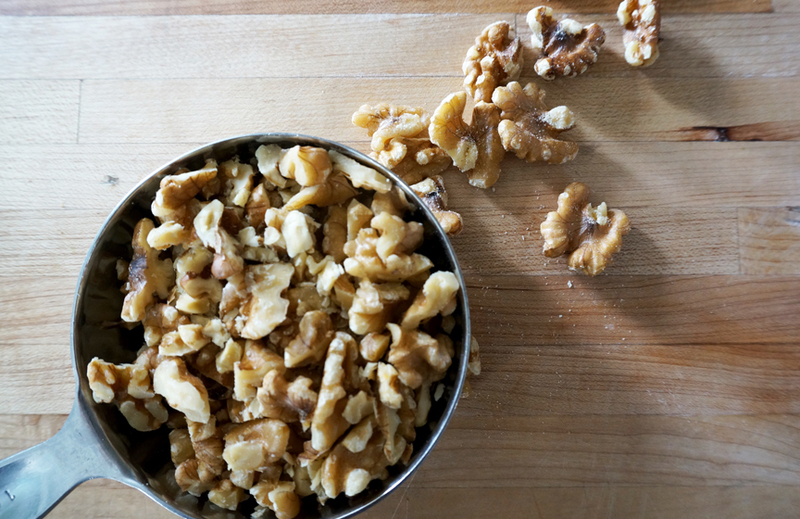 I like walnuts, pecans, or almonds best in my matzola, but suit your own taste. 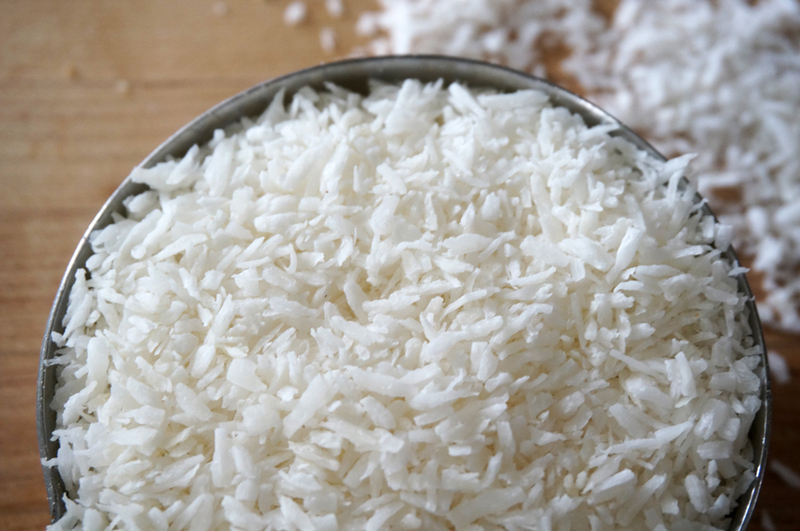 Next, a big scoop of shredded coconut. Season it with some cinnamon, nutmeg, cardamon and salt and toss like a salad. Then mix together the melted butter and the syrup and stir that into the matzo mixture. You have to make sure to mix it really well, I usually use my hands. Spread the whole michegas on a rimmed baking tray and pop it in a 325 oven for 15 minutes, stirring halfway through. When the time’s up, pop the tray out of the oven and let it cool for about five minutes before mixing in some dried fruit. 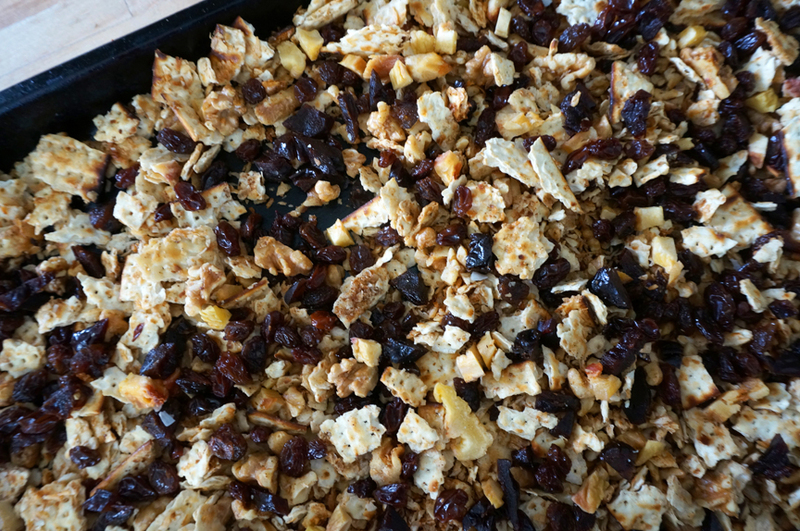 Here I did a blend of dried peaches, prunes (hey, gotta counteract all that matzo! ), and raisins. Store in an air-tight container for up to eight holy nights though I doubt it will be around that long! 1 1/2 cups nuts of your choice, roughly chopped. 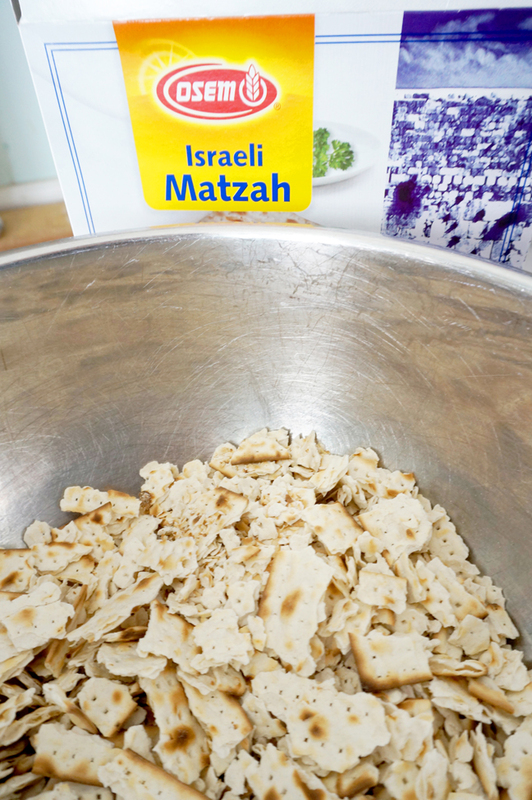 Crumble the matzo into bite size pieces in a large bowl. Add nuts, coconut, salt, cinnamon, nutmeg, and cardamom, and mix well with your hands. In a small saucepan, melt the butter. Remove from heat, stir in the maple syrup, and pour over the crumbled matzo mixture. Mix very well and spread on a rimmed baking sheet. Bake for 15 minutes, stirring halfway through to make sure all matzo gets crisped and none gets overcooked. Remove from oven and let cool slightly, then stir in dried fruit. Store in an airtight container for up to 8 days.